While my balcony eagerly awaits the release of BioLite’s FirePit, I’m testing their new off-grid-in-a-box solution, and it works like a charm. The SolarHome 620 isn’t BioLite’s first rodeo in solar, electricity, or lighting by any means, but the no-plug-necessary and play nature of the package is really something to behold. 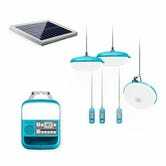 To set up the SolarHome 620, you put the solar panel in the sun, and put the three included light fixtures wherever you like. You can go all out and put the panel all the roof, run wires through walls and all that using a generous amount of mounting hardware, or you can haphazardly use something like 3M strips and put the panel on a chair outside- whatever your use case demands. Each light has its own dedicated on/off switch, and the SolarHome 620's control box also has a built-in FM radio, card slot for playing MP3s, USB ports with a charging shelf, and its own light (so there are really four lights). There’s even a motion sensor if you decide to hang one of the lights outside. BioLite has always been a company split between making technical, magical camping equipment for the first world, and building amazing but attainable products for people who can’t take access to gas, electricity, heat, or clean water for granted. The SolarHome 620 is their first crossover product, and is currently (get it, current?) delivering electricity to 5000 homes in Kenya, and maybe soon to your off-grid cabin.